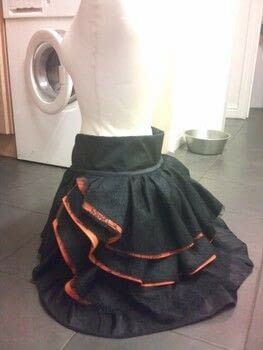 I love all things burlesque, and came across this sight whilst searching for ways to make a bustle skirt on the tinternet after seeing some girl ( wiv excellent pins I might add ) wearing a bustle skirt. I was so jealous I just had to know how to make one. So I followed some simple instructions i found on ere and added a few tweeks of my own and this is the finished product. My pattern is cut so when i cut the fabric i did so on the fold. 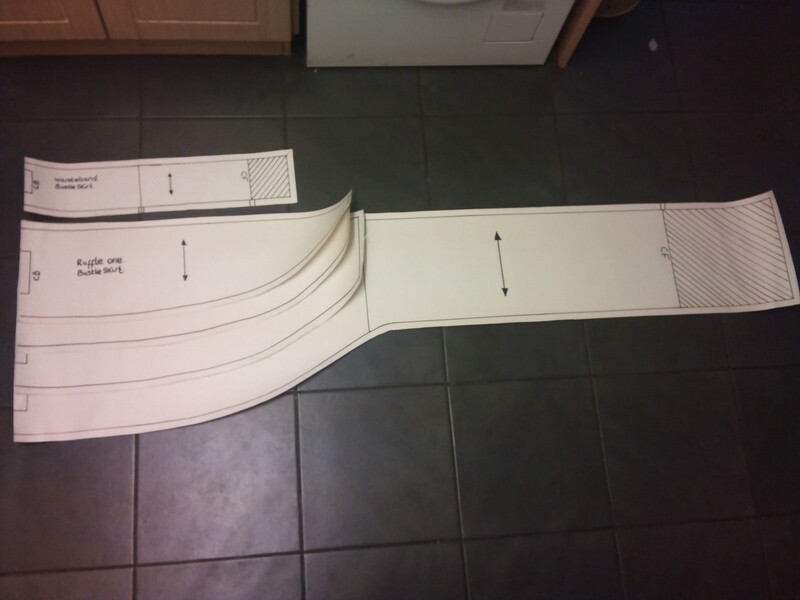 I took all the width measurements and 1/2 them. On them I marked balence points (These help u line up the fabric once cut) at the overlap point, and side points. 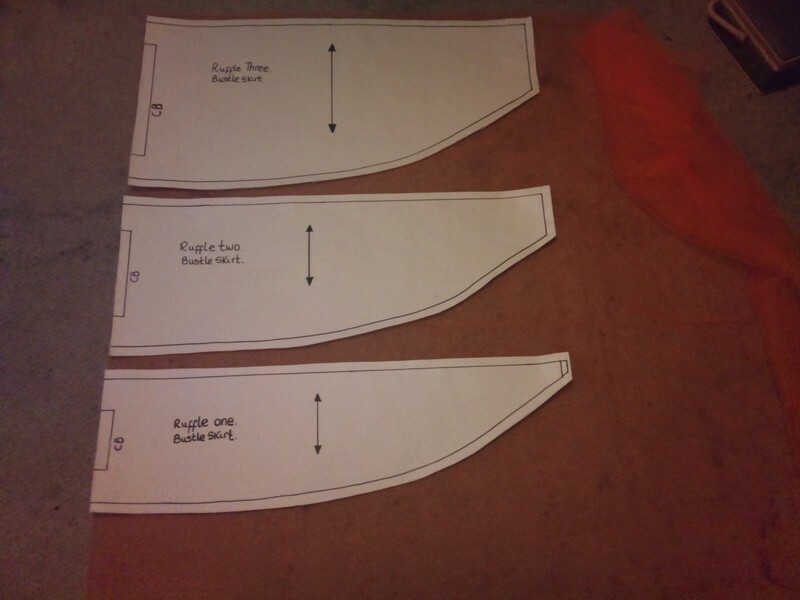 I also marked the CF, CB and fold of the fabric. 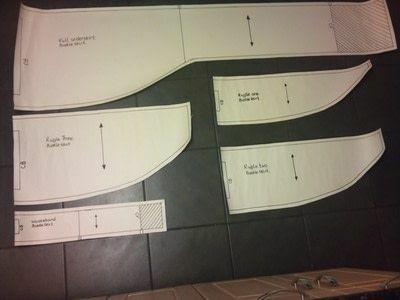 Add seam allowances (1.5cm) to hem line, top and side. Do not add seam allowance to CB because it is on a fold. Unless u entend to cut it as 2 seperate pieces and join together later. I drafted my pattern on a roll of lining paper from a DIY store. You get about 10m for 2 quid but i guess u could use newspaper or wrapping paper. 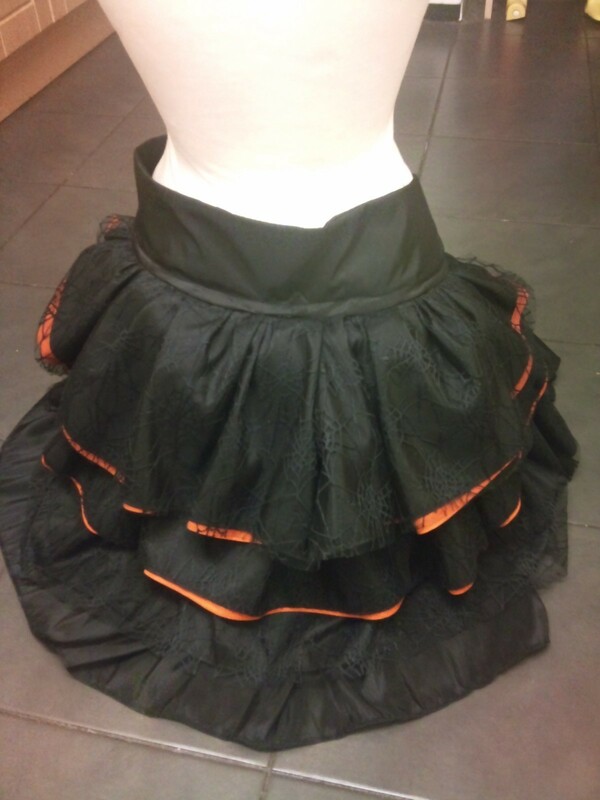 Each of my ruffles is made up of three layers black lace over Black taffeta, to give it some texture and underneath orange netting to give it volume, the underskirt is made of a single layer of black taffeta. Only the ruffles are cut in these fabrics. 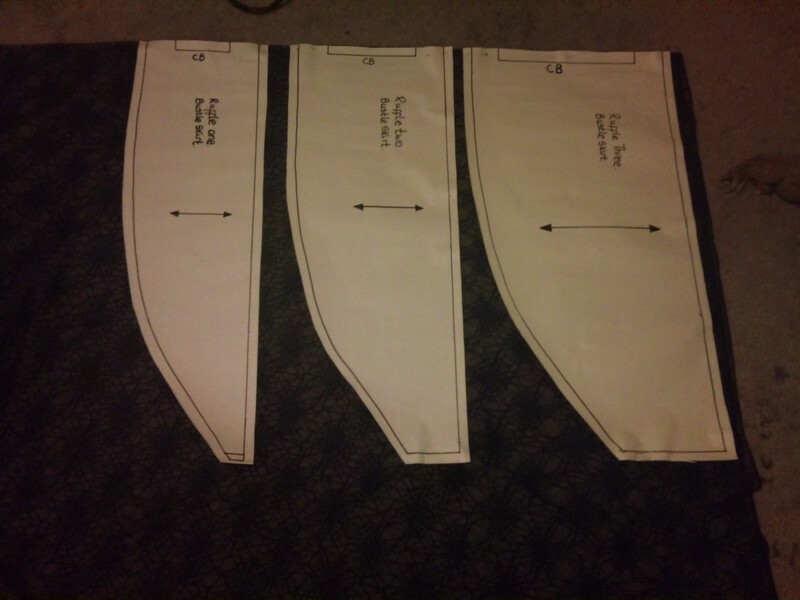 Fold fabric and cut one of each. Ruffles waistband and underskirt are cut in this fabric. Again fold fabric in half and place each of the pieces against the fold. Cut all the pieces once, except the waistband, u will need 2 of these. First i overlocked all the raw edges. You can also do this using the zig zag stitch on your sewing machine. It isn't essential but leaves a much neater finish. 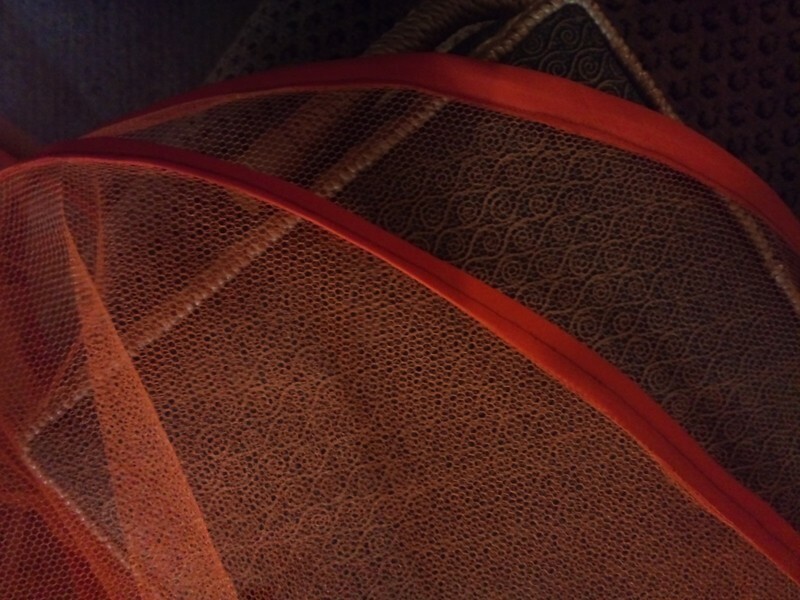 I trimmed the hem on the orange netting with bias binding. Again this isn't essential but i think it looks much neater. 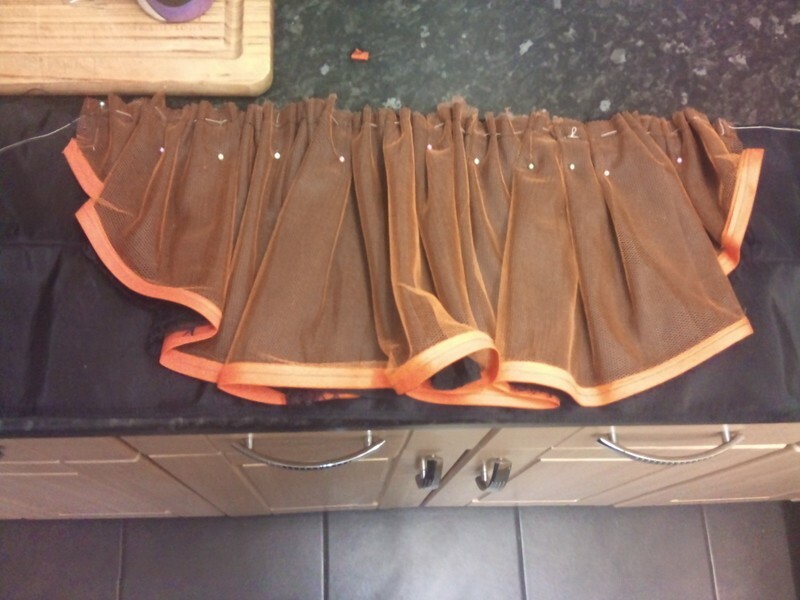 Having prepared the individual components i began constucting my ruffles. each ruffle ha three layers; lace, taffeta and net. i neatly stitched along the top to hold the layers in place. I then gathered the ruffles. I did this by hand usinga basic running stitch. I believe you can do this on your sewing machine but the skill eludes me.Once each of the Three ruffles and the underskirt was prepared i turned my attention to the waistband. I stiffened the waistband by ironing facing on each of the waistband pieces i then pet right sides together and stitched along the top of the waistband. Open out waistband right side up and begin pinning ruffles and underskirt ono it. Stith across top.. 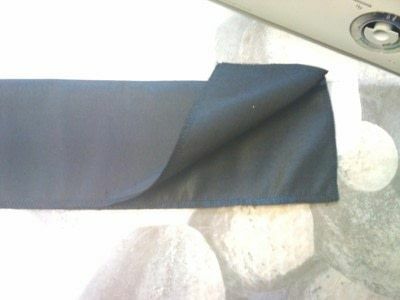 Fold waistband i on its self and close seam eaten off edges. Try on and mark whwer u want buttons to go. add button holes and buttons. 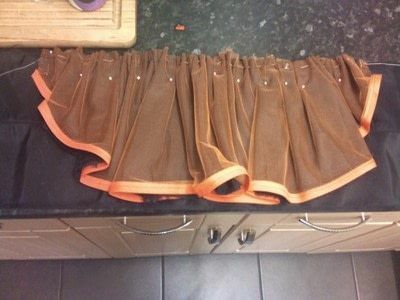 this skirt is just so amazing! I love it!